The Best Telecom blogs from thousands of top Telecom blogs in our index using search and social metrics. Data will be refreshed once a week. 2.13 2600Hz Blog | Next Gen VoIP Solutions! Telecom newsletter is a comprehensive summary of the day's most important blog posts and news articles from the best Telecom websites on the web, and delivered to your email inbox each morning. To subscribe, simply provide us with your email address. UK About Blog Telecoms.com is where the telecoms industry goes first for the latest news, in-depth analysis, interviews with senior industry figures and insightful market intelligence. Facebook fans 1,521. Twitter followers 26,417. About Blog Business information about the telecom industry, an extensive overview of telecom-related articles plus in-depth market commentary and research. National and international businesses, organisations and government bodies use our information to make decisions across all organisational levels and to help develop their policies. Facebook fans 2,068. Twitter followers 5,243. About Blog RCR Global Wireless News provides readers with mobile network operator news insights. Facebook fans 5,327. Twitter followers 25,034. About Blog Comprehensive up-to-date news coverage for telecom, aggregated from sources all over the world by Google News. Facebook fans 21,875,060. Twitter followers 212,823. About Blog All things linked to telecom - wired and wireless. News, research, theory, ideas, ventures, business, forecasts, analysis, discussions, controversy, etc. Facebook fans 1,081,315. Twitter followers 465,652. Hong Kong About Blog Telecomasia.net is a one-stop telecoms information portal, providing comprehensive daily news coverage as well as analysis, insight and commentary on industry trends and developments. The site is the essential resource for telecom executives looking to keep their pulse on the fast-developing Asian market. Facebook fans 3,228. Twitter followers 9,584. New Delhi, India About Blog ETTelecom brings latest telecom news, views and updates, get telecom industry news from all top sources for Indian Telecom industry. Facebook fans 6,236. Twitter followers 28,362. India About Blog Telecomtalk is a popular Indian telecom portal, brings operator news, tariff plans, broadband, 3G & 4G updates and analysis on the DTH and Mobile sector. Facebook fans 62,529. Twitter followers 43,580. About Blog Telegeography is a market research and consulting firm that provides various online reports. Research areas include International networks, undersea cables, service providers, and wholesale circuit pricing. Facebook fans 831. Twitter followers 2,377. Ealing Broadway, London About Blog RingCentral offers cloud communications solutions for businesses of all sizes. Follow us to keep up with news and tips about VoIP and latest cloud communication trends. Facebook fans 39,217. Twitter followers 2,632. Worldwide About Blog Blog from thought leaders of the telecom industry about Digital Economy, OSS, BSS, mobile, 4G, LTE, Big Data, Customer Experience, customer service, customer engagement, CSP, Revenue assurance, Fraud Management, business assurance, revenue management, Internet of things, CRM, revenue analytics, marketing analytics. Facebook fans 941. Twitter followers 2,180. Washington, D.C. About Blog FierceTelecom covers the latest news on telecom companies, backhaul, ethernet, IPTV, and other trends driving the telecom industry into the future. Facebook fans 718. Twitter followers 17,432. 13. 2600Hz Blog | Next Gen VoIP Solutions! San Francisco, CA About Blog We build scalable, next-generation VoIP solutions for carriers, ITSPs and Cloud Solution providers. 2600Hz is the leading provider of mobile and cloud communications software, empowering users to take total control and ownership of telecom. Facebook fans 2,863. Twitter followers 2,699. London About Blog News and analysis for global telecom and ICT professionals. Wireless and wireline, content, services, and infrastructure. It is the leading communications link between end users and the vendors, carriers and resellers of telecommunications technology and services. Facebook fans 2,651. Twitter followers 30,848. About Blog Telecom Ramblings is devoted to news, commentary, and analysis for the telecom and internet infrastructure sectors. mission of Telecom Ramblings is to spread the word about the next generation of telecommunications infrastructure from an independent viewpoint. Facebook fans 635. Twitter followers 7,724. Arlington, VA About Blog The Telecommunications Industry Association (TIA) represents the global ICT industry through standards development, advocacy, tradeshows, business opportunities, market intelligence and world-wide environmental regulatory analysis. Facebook fans 1,217. Twitter followers 3,926. Bristol, London About Blog TelecomsTech is a practical resource for the telecoms industry. Serving professionals, developers, operators, marketers, outsourcers and hardware manufacturers, it delivers the most insightful, informative and up to the minute blog & news content from around the web. Facebook fans 3,230. Twitter followers 4,385. New York, USA About Blog Field Engineer is an online marketplace that connects businesses who have jobs with Telecom Engineers who have the skills and availability to complete them. Facebook fans 641. Twitter followers 1,155. 240 Chapel St, Vic, Australia About Blog Spirit Telecom provides Fibre Optic Broadband Lightning Fast Internet to Apartment buildings, commercial buildings and MDUs in capital cities around Australia, including Melbourne, Sydney and Brisbane. Blog post showcases VOIP evolution with information on ISP'S and fiber optics. Facebook fans 3,469. Twitter followers 226. London About Blog Global Telecoms Business is the leading intelligence source for senior managers who run telecoms carriers worldwide. It provides business people, who manage service providers, with a strategic perspective on the issues that most affect the industry. Facebook fans 351. Twitter followers 7,119. London About Blog Keep up-to-date with mobile and telecom networking in emerging markets worldwide. Developing Telecoms has the latest news, case studies, white papers and more. Facebook fans 219. Twitter followers 1,486. Washington, DC About Blog USTelecom providing advanced communications services to markets both urban and rural. USTelecom advocates on behalf of our members on critical broadband and telecom industry issues including universal service, intercarrier compensation, broadband adoption, and more. Facebook fans 466. Twitter followers 2,804. Florida About Blog A cell tower and wireless telecommunications blog. Our mission is to provide landowners, municipalities and venue owners with the knowledge they need to successfully negotiate leases with tower companies and wireless carriers. Facebook fans 138. Twitter followers 1,827. Facebook fans 105. Twitter followers 415. Rijeka About Blog Providing Telecom Expense Management services including: bill audit; bill recovery, inventory asset; billing optimization; strategic planning, contract negotiation & technology consultation. Because we are Independent and Specialized in optimization, negotiation and monitoring of contracts with different suppliers of telecommunications and technologies of the market. This allows to deliver to the clients an important SAVING strategy that is SELF-FINANCING with savings committed with the outcome. Facebook fans 208. Twitter followers 7,790. About Blog At Beacon Telecom, we focus on providing exceptional service. Facebook fans 208. Twitter followers 171. Canada About Blog A Canadian perspective on trends in telecom. Mark H. Goldberg and Associates provides a full range of consulting to the telecommunications industry, including: business planning, strategic advisory services, carrier relations, regulatory and government relations, network design, RFP evaluations, project management and operations reviews. Facebook fans n/a. Twitter followers 4,143. Washington, D.C. About Blog Legal and regulatory updates for the telecom industry. Facebook fans n/a. Twitter followers 236. About Blog News, analysis, commentary and strategic thinking on advanced telecommunications infrastructure. Facebook fans n/a. Twitter followers 121. Bonn / Germany About Blog Deutsche Telekom is one the leading telecom companies in the world having a huge workforce of over 220,000 employees spread worldwide. Facebook fans 75,142. Twitter followers 63,190. Newton, Massachusetts About Blog News, analysis and technical advice about the telecommunications industry and its most critical technologies. Topics covered by SearchTeleCom are core and access networks, telecom business issues, telecom network operations, wireless and mobile carrier networks. Facebook fans 3,313. Twitter followers 19,003. Raleigh, NC About Blog In this blog from Red Hat, we cover relevant topics, news, industry events, webinars and articles of interest spanning four our most important commercial segment verticals telecommunications. Facebook fans 108,525. Twitter followers 105,711. Global; HQ: Noida, India About Blog Blog post covers Telecom industryy news and updates. Facebook fans 1,454,462. Twitter followers 354,702. Worldwide About Blog It’s all about what matters to you and about what you tweet to us. We will connect what’s essential in your life. Orange is one of the world’s leading telecommunications operators with sales of 39 billion euros in 2014 and 156,000 employees worldwide. Facebook fans 22,476,138. Twitter followers 216,656. Washington, D.C. About Blog Cable industry news brought to you by the FierceMarkets Telecom Group. FierceCable is a daily business and technology briefing for cable service providers that covers trends in voice, video, and data service delivery. Facebook fans 134. Twitter followers 4,460. World Wide About Blog CircleID is a collaborative news and opinion website where professionals come to connect, inform and be informed about the latest developments that are shaping the Internet. Facebook fans 853. Twitter followers 5,907. Stockton on Tees About Blog Independent telephone and broadband engineers and to domestic and small business customers, fixing phone wiring and having fun. So, we began as traders in used equipment, moved into recycling as clients realised their environmental responsibilities, and now also work as telecommunications engineers. Facebook fans 15. Twitter followers 34. Facebook fans 897. Twitter followers 16,354. Islamabad, Pakistan About Blog Telecom Academy a blog about Telecommunication, GSM, 4G, 5G communication, Technology, Tutorials, Ebooks, Note, and much more. Facebook fans n/a. Twitter followers 66. About Blog Your trusted experts in telecom management. At Cannon Group, we use our expertise to provide insight and well-informed opinions on the latest industry news. Facebook fans 29. Twitter followers n/a. Geneva, Switzerland About Blog ITU Telecom World 2017 is the global platform for high-level debate, networking, innovation-showcasing and knowledge-sharing across the ICT community. ITU’s mission is to enable the growth and sustained development of telecommunications. Facebook fans 59,950. Twitter followers 52,462. México, D.F. About Blog América Móvil is the leading provider of integrated telecommunications services in Latin America. Through the development of a world-class integrated telecommunications platform, we offer our customers a portfolio of value added services and enhanced communications solutions, in 25 countries of America and Europe. Facebook fans n/a. Twitter followers 282. United Kingdom About Blog Tech Advance Ltd is a provider of business telecommunications services to the UK business market. Founded in 2001, it has worked with many different types of organisations providing specialist expertise in the deployment and ongoing management of communications technologies. Facebook fans 48. Twitter followers 702. University Park, PA About Blog A provocative, unsponsored assessment of current and future legal, regulatory, marketplace, and cultural issues affecting telecommunications and information policy presented by Rob Frieden, Pioneers Chair and Professor of Telecommunications and Law, Penn State University. Facebook fans n/a. Twitter followers 304. Facebook fans 634. Twitter followers 416. About Blog Keep up with Verizon, Frontier and New Telecom. Boston, MA About Blog The Telecommunications Media Group, through its online properties centered around www.telecomengine.com, is the telecom industry’s premier media outlet. We cover broadband, wireless, M2M and services like nobody else in the industry. Facebook fans 951. Twitter followers 5,285. 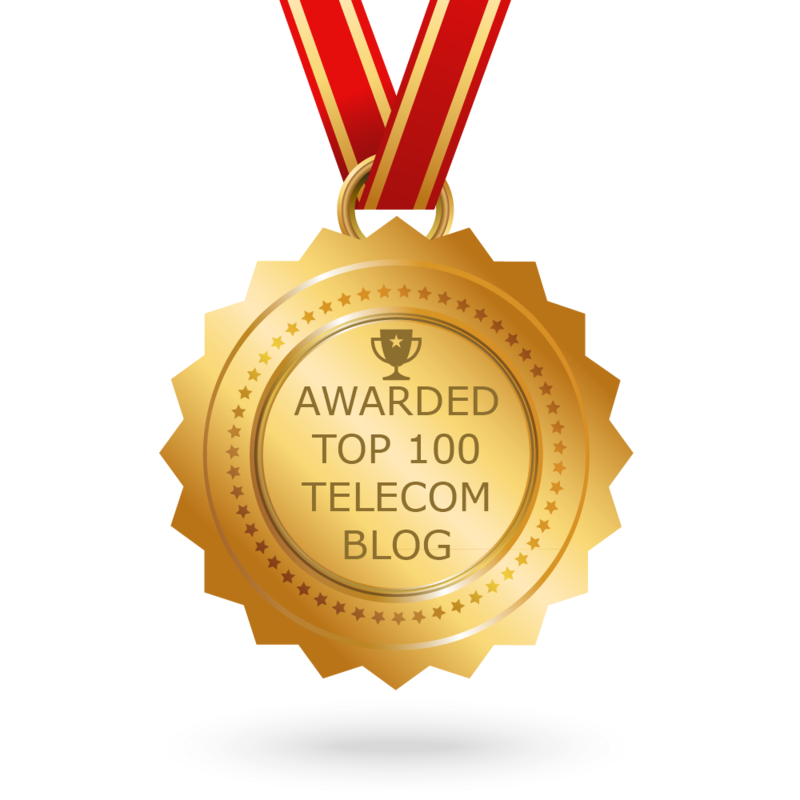 CONGRATULATIONS to every blogger that has made this Top Telecom blogs list! This is the most comprehensive list of best Telecom blogs on the internet and I’m honoured to have you as part of this! I personally give you a high-five and want to thank you for your contribution to this world.